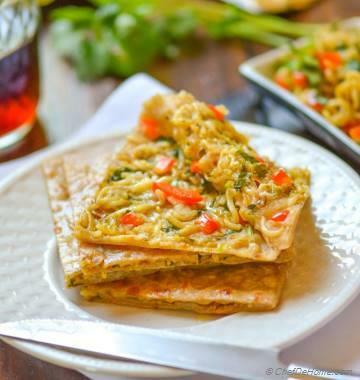 Salted Fenugreek Crackers, a perfect tea-time snack. 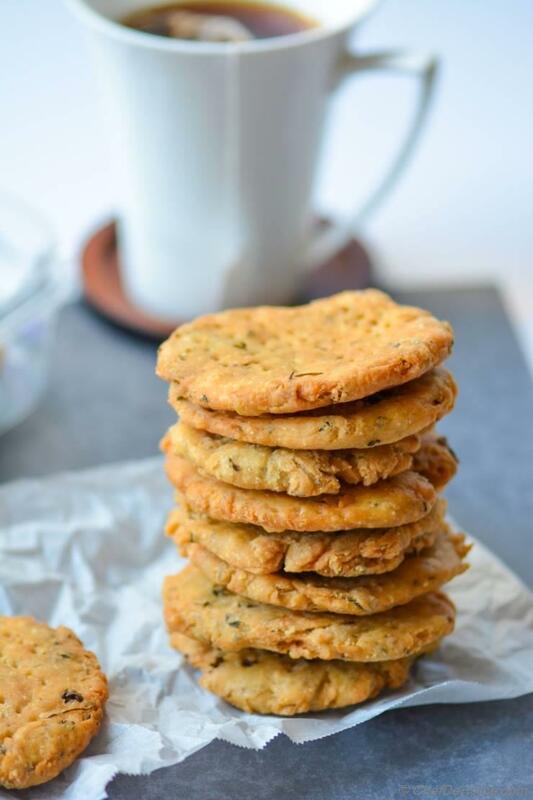 Always enjoy these homemade buttery salted crackers with cup of hot tea! A lot of sweets/savory preparations world-wide are made with all-purpose white flour.. probably that's why it's called all-purpose. Be it Indian Gulab Jamun or American Twinkies, no matter how these are made, all are pretty darn tasty always! then why cook all these treats at home? Well... home cooking gives us opportunity to make'em little healthier (a touch of whole wheat and all.....), and fresher (and with some love.... the most imp ingredient (patent homemade ;)). 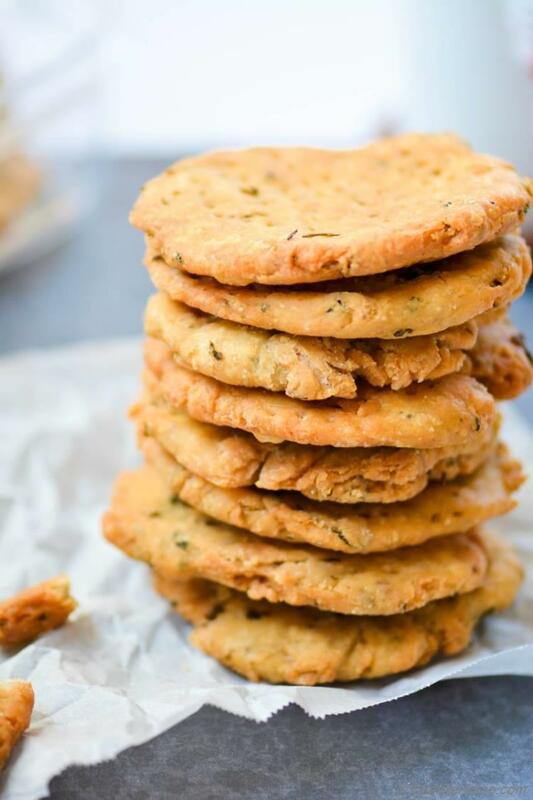 Namkeen (Salted) Methi (Fenugreek) Mathri (Crackers) is one such delightful fried Indian finger snack that is traditionally made with all white flour (called "maida" in hindi) and lots of butter/clarified butter. 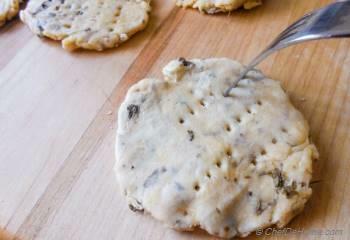 White flour gives these crackers fine texture and clarified butters adds the crispiness. These snacks are easily available in Indian Sweets Store during festive season, but I love make some at home. Past two weeks, there were several Indian festivals, one after another, which kept me very busy... One of such festival, almost celebrated all-over-India and especially popular in north India is called Karwa Chauth. On this day, married ladies keep a day's fast for long life and well-being of their husbands. For ladies, it is a fast day, but, for rest of the family, it is the day to eat a lot of sweets, snacks, and authentic Indian food. My home is no different Indian household. Day before the fast, I made these traditional Fenugreek Crackers to eat for Sargi (early morning fasting meal, before sunrise). I also made sweet version of these crackers to eat after pooja (idol worship) in the evening. (will share that recipe too). I don't fry a lot of stuff frequently, but... these holidays and festivals days demand something rich and comforting... you know what? Vishal was ecstatic looking at fried snacks for teatime. :) Growing up, his all festivals were defined as fried sweet and savory food all day. And who doesn't love deep fried, crispy and butter goodies to enjoy. I guess, specially during holidays and festival season, no one wants to remember dieting, healthy eating etc... yet homemade treats have fresher ingredients and natural preservatives that gives me some piece of mind. So.... almost half batch of mathri crackers disappeared with evening tea, a day before fast. Rest.... you can imagine how long it lasted? However, I did not cook everything at home, did buy some Indian sweets. 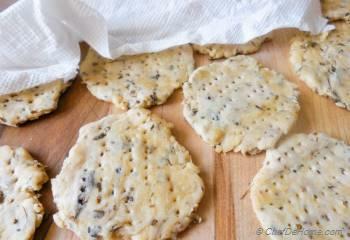 I have to tell you.... those were no where near tasty/fresh like these homemade crispy crackers. 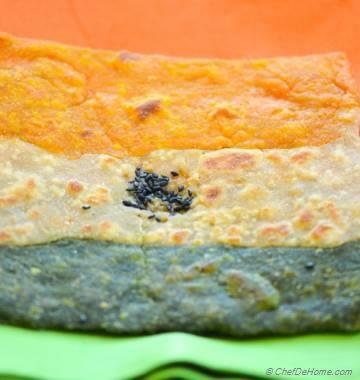 You can even make these crackers with all wheat flour instead of white. See, this is the beauty of home-cooking, change recipe, adapt to your life-style and make it your own! 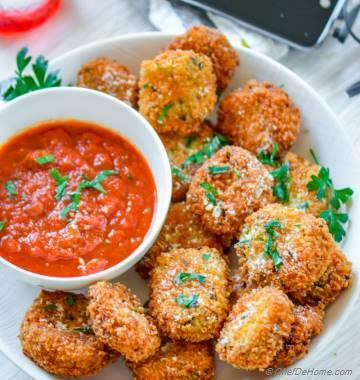 All-in-all, I had great time cooking and serving these snack bites and even more loving to share this recipe with you. 1. 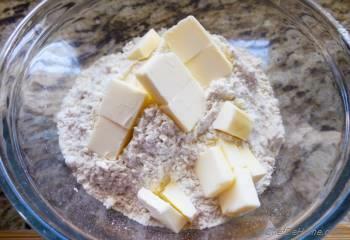 In a large bowl, add all-purpose and wheat flours. 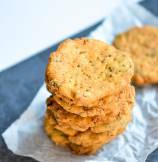 You can use all wheat flour or all all-purpose flour too. Add cold butter cut into pieces (or ghee at room temperature not warm). 2. 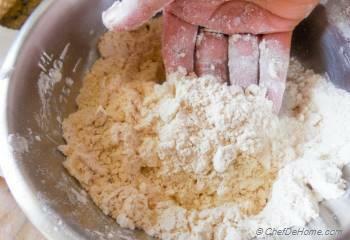 Massage the flour and butter/ghee with fingers until it has bread crumbs like consistency. You can also process flour and butter in food processor in 7-8 quick pulses. 3. Add fenugreek, salt, black pepper, carom seeds and mix well to distribute. 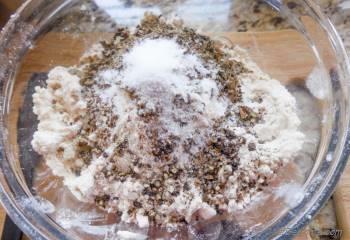 Or in food processor add all ingredients and pulse two times to re-distribute. 4. Add water (preferably cold) 1-2 tbsp at a time until dough comes together. Dough should be firm and just holding together not pliable or soft. 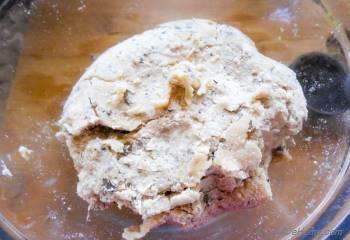 Or in food processor, close the lid with motor running on slow, add water until dough just comes together. 5. 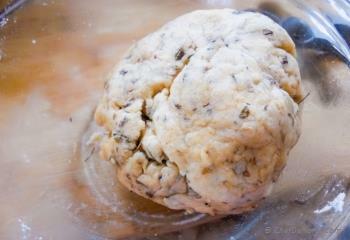 With oiled hands make a smooth dough-ball and cover. set aside for 5 minutes. I meantime, heat oil in a deep frying pan for frying crackers. 6. 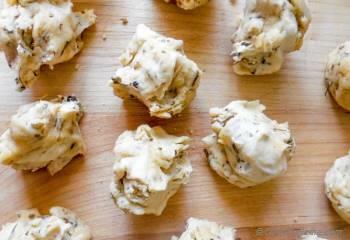 Divide dough into 12 equal size portions. 7. Roll each portion to a rough 2-2.5 inch round (edges will be rough, this make'em look traditional. so don't worry). If you want neat and smooth edges, then use a cookie cutter. Poke 5-6 times with fork on rolled dough. While working on dough portions, always keep rolled or un-rolled portions cover to prevent dough from drying out. 8. Poke 5-6 times with fork on both sides of each rolled mathri. Keep rest covered while working on a few. 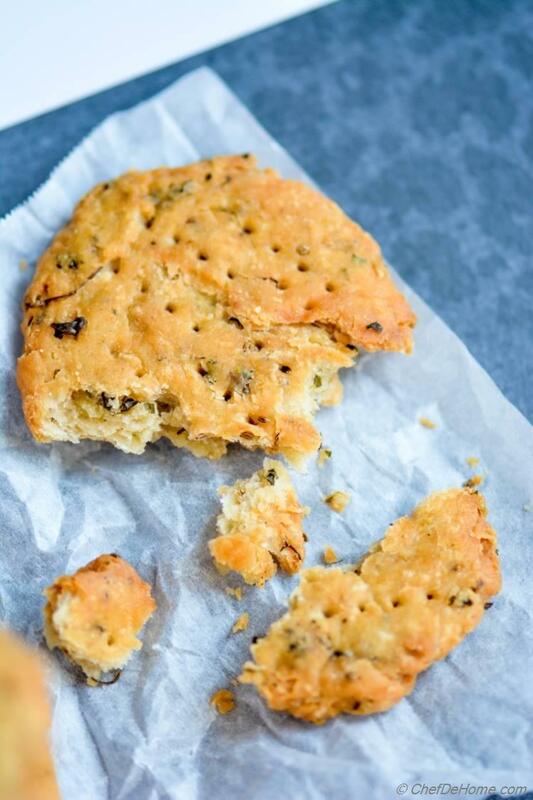 Fork holes insure mathri does not puff in oil or it will not be crisp but soft inside. 9. 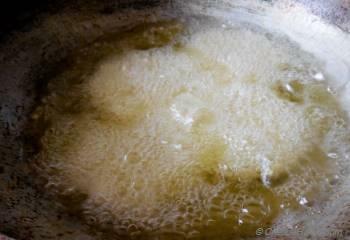 Deep fry mathri in hot oil 3-4 at a time. At right oil temperature i.e. 375 F. Read notes at end of recipe about - how to find right temp of heating oil without thermometer. 10. Each batch takes about 4 minute to fry. 11. Drain fried mathri (crackers) on a plate lined with paper towel. Again, don't overcrowd, make a single layer or heat of new crackers will make ones sitting at bottom soggy. 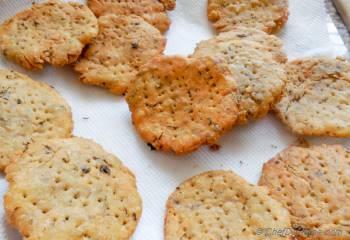 Serve warm mathri crackers with hot tea as evening snack. Keep remaining (room temperature mathri) in air-tight tin/plastic container. Enjoy! Don't overcrowd the pan while frying. It will drop oil temperature and mathri will not cook properly and get soggy/oil drenched. Also, don't let mathri get over brown in oil. They should be just golden when removed from oil. You can increase the amount butter by 1-2 tbsp to make crackers crispier. 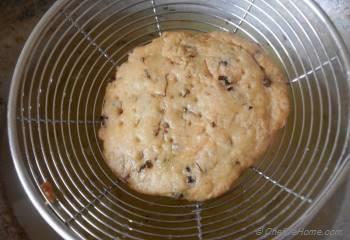 If dough rising to top at count of 3-4, it is at right temperature. 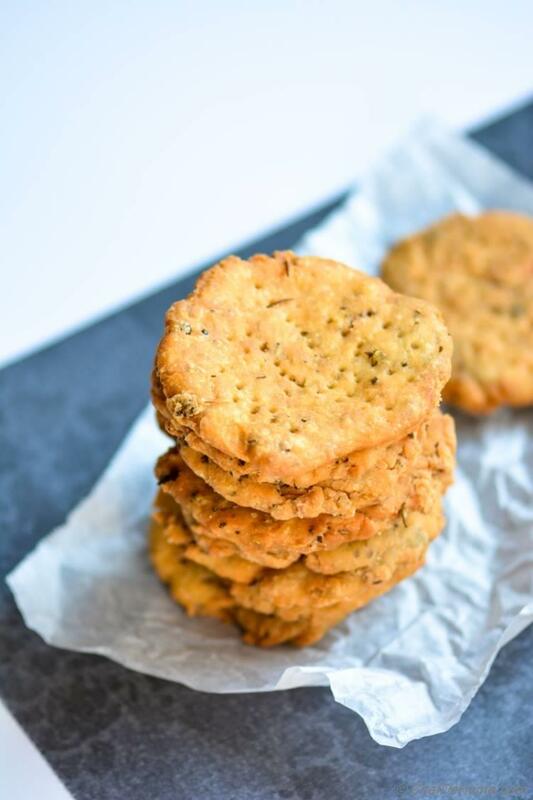 If dough gets to top immediately, it means oil is over-heated, lower the temp before frying or hot oil will brown crackers very quickly whereas inside will be raw.